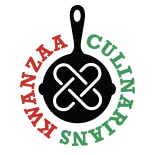 In preparing for this year’s Kwanzaa Culinarians, I reread some of my favorite books. Dr. Nikky Finney’s “Head Off and Split” and “Rice“, Dr. Jessica B. Harris’ “High on the Hog“, and Adrian Miller’s “Soul Food: The Surprising Story of an American Cuisine, One Plate at a Time” were among the many I got into and when I finished these beautiful and thoughtful works I realized that what I wanted to talk about was history and the clarity that context always gives us if we would only pay attention. It’s always fascinating to find myself at a gathering of food folks. Whenever food people get together there is bound to be a super nuanced conversation happening around American foodways. In multicultural gatherings these brilliant chefs and bloggers and writers and food justice activist engage in very high minded dialogue about buzz word topics like food access, urban farming, professional diversity in the culinary world, and cultural appropriation; topics that are indeed very necessary, but far too often lacking in historical context. Inevitably the conversation gets backed into a politically correct corner, and becomes another painfully circular conversation that never quite gets to the heart of the matter which is that in our foodways, as in most things, if we look back and show some respect for historical context most murky issues become miraculously clear. In the Beginning, African people from all over the diaspora, both free and enslaved, built American cooking. Let that sink in!!! From Herculese to Nat Fuller to Patrick Clarke, from Anne Northup to Edna Lewis to B. Smith, brown people from slavery to today have worked and studied and poured their hearts and souls into the culinary service of the American diner. Some of these luminaries couldn’t even read, but using their innate culinary talent were able to cook their way into physical and mental survival , comparatively better lives for themselves and their families, elevate their social/cultural status in a way few other crafts or trades could, and in the process, gave this country its culinary foundation. This very simple, very singular fact allows for a profound diametric shift in the way we look at American cooking and many of the complex issues facing black America. Our collective foodways become much simpler to tackle on the multiple fronts we fight on simply by looking back. Take that time Paula Dean made those unfortunate comments about the good ole days of the antebellum south. There was outrage, but there was also history, and and it gave us the opportunity to have honest and open discussions about who and what the good old days were really about from folks like the brilliant Michael Twitty in his open letter to her. When our black farmers were fighting and still continue to fight for their land sovereignty its was looking back to trailblazers like Fannie Lou Hammer for the blueprint of how to fight for land rights. When we talk about sustainable agriculture and its power to combat hunger, aide healthcare, and promote community empowerment we are able to look back to slavery and the imported foodways, then to the sharecroppers and their connection to food source, then to the black panther party with their agriculture programs, then to Edna Lewis and her brilliant words on sustainable eating to know that our ancestors and elders had the master culinary plan way back then, if only we had honored their lessons. When yet another, seemingly well meaning, publication writes yet another reductive article about where all the black chefs are, as though they were actually looking, w e can use historical context to talk about the hundreds of thousands of working black chefs in this country, and abroad, who may not have television shows, but who cook in the pristine toques of entrepreneurs, restauranteurs, chefs, activist, and educators as far back as the birth of this nation who saw the value in food as culture long before there was a “foodie”. We are living in exciting culinary times. As a working chef I watch clients more engaged with food and culture than they’ve ever been. As an industry we are more profitable and there are many more new and emerging professional avenues to explore, but I guess I want to be sure that as we mature as a food nation, we remember all the souls that got us here. So many of the issues facing our country’s food system are first world problems. Important, to be sure, but there are definitely drastic and varying degrees of seriousness, and in the grand scheme of things the earth will still turn and Americans will still dine whether we remember our past or not, but I want to tell you that there is something transcendent and beautiful and empowering about being able to stand in the sweet rarefied air that the likes of brave Africans making the middle passage stood in, that Abby Fischer and Carson Gulley and Rufus Estes and the Augustine family and Edna Lewis and Patrick Clarke and Darryl Evans all stood in, that Joe Randall and Leah Chase and Toni Tipton Martin and Charlotte Lyons and Dr. Jessica B. Harris all purify and clarify for us. American is really in its culinary infancy, so to toss away historical context would be a forfeit of the rich and hard fought legacy in food our ancestors bequeathed us, and I for one want to claim and be worthy of my culinary birthright! Chef Therese Nelson is a classically trained, east coast bred, NYC based, private chef, and the founder and culinary curator of Black Culinary History.com, a site devoted to the thoughtful preservation of black heritage in the culinary arts throughout the African diaspora. This entry was posted on December 29, 2014 by Therese Nelson in 2014, Personal Story, shopping and tagged Adrian Miller, African diaspora, black chefs, black culinary history, black farmers, black history, black panther party, culinary justice, culinary revolution, dr. jessica b. harris, Dr. Nikky Finney, edna lewis, fannie lou hammer, food history, history, lessons from our past, middle passage, Nikky Finney, out of our past, paula deen, Therese Nelson.